On display at booth C5D, the brand new 5 GHz Point-to-Point (PTP) solution, named Quanta 5, addresses the increase in Internet of Things (IoT) applications as well as the rising number of connected devices requiring more reliable bandwidth. 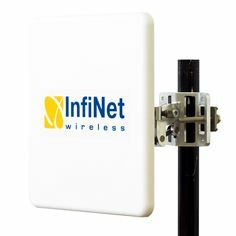 It also has been designed to offer the highest spectral efficiency available in today’s wireless marketplace. Quanta 5, the company’s latest Software Defined Radio (SDR) technology, is designed entirely by InfiNet’s R&D teams and has the ability to eliminate interference in noisy radio environments whilst being able to deliver more Mb/s in less radio spectrum than ever before. This record-breaking solution is also able to operate in sub-zero temperatures as well as extremely hot conditions, ensuring at all times that the data is transmitted reliably and delivered across large distances. Quanta 5 is ideal for the transmission of high-resolution video streams, the provision of Internet and Intranet access, as well as for backhauling all types of traffics, whether generated by a Wi-Fi access point or a service provider’s 4G/LTE base station. This SDR solution has been designed with the user in mind as it’s easier than ever before to deploy and use, cost-effective and exceeds performance expectations.